May 15, 2018 (LBO) – Facebook’s global ‘Boost Your Business’ program is now available for the youth and entrepreneurs of Sri Lanka. 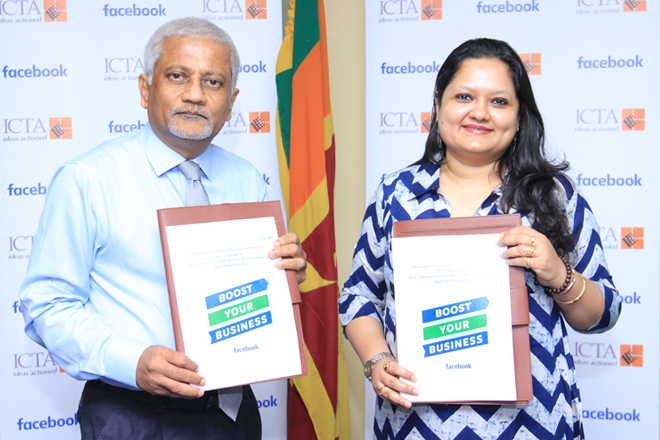 Facebook has partnered with the ICTA of Sri Lanka to train 10,000 small business owners across the country by the close of 2018. In the first phase, the programmed will cover Colombo, Galle, Kandy and Jaffna. The inaugural ‘Boost Your Business’ workshop, to be organized in Colombo on 16th May, will orient, teach and train entrepreneurs’ on the effective use of Facebook to grow and monetize their businesses online. The workshop will specifically teach attendees to build a digital presence for free, leverage the mobile economy to gain market access and grow their businesses. “With Facebook’s reach and support, we will be taking a step forward in leveraging the potential of ICTs for the economic betterment of the country”. ‘BoostYourBusiness’ will complement the SMART Social Circles initiative by the ICTA to promote digital literacy and foster ethical and responsible use of social media. Facebook will also work with ICTA to develop a strategic roadmap for a collaborative information sharing platform for citizens under the SMART Social Circle initiative. Persons coordinating SMART Social Circles at district level will also be trained on the use of Facebook tools to share community updates. There are more than 60 million businesses around the world who actively use Facebook Pages because they are free, easy to use, and they work well on mobile. Small businesses discover Facebook for their business because they know how to use it personally: setting up a Page is just as easy as setting up a profile. And Facebook is where their customers already are. Boost Your Business Training will lead to increased collaboration and sharing of information between the government and connected regions of Sri Lanka and increased interaction and information sharing across regions.